I am allergic to grass so I never cut it, rarely sit in it, but I can surely appreciate when someone else cuts it. So, when they cut it to look this cool you have to give a shout out for it. 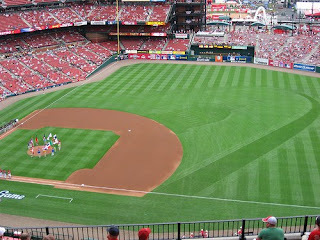 I found this picture on flickr, so I am sure there are better official pics of the super job the grounds keepers at Busch Stadium have done for the MLB All Star game this week. How cool is that? For those not familiar with the St. Louis skyline, that is the Old Courthouse and the Gateway Arch cut into the field. You can't tell from this picture but the view from home plate looks out to the Arch. So it is cool for these two landmarks to be replicated in the field. On TV it looks really cool to see the field against the backdrop of the real Arch. And then Laurie has posted an swesome article about the health benefits of sewing. Go check it out.